After lunch with Kapil, I embarked on another trail of Singapore's history, the World War II. Years earlier, my sister Neelima had visited the Changi Museum which traced Singapore's history during that dark period. The pictures she had shown me were deeply ingrained in my mind and I had to visit this place. By the time our lunch at Amoy Street Food Centre, it was raining real hard. But I was really short of time. So I bid adieu to Kapil, after scheduling to meet again on the weekend. I walked down to Tanjong Pagar MRT to get onto the East West line, to head to Tenah Merah, the MRT closest to Changi Museum. The ride itself took quite a while and then took a SBS bus, bus no. 2 to the museum, a good 30 stops away. The bus ride was not boring at all as I had thought it would be. I passed by industrial and IT zones- it was amply evident that the eastern side of the island, where Changi is located, is where Singapore is expanding. The ride didn't take too long, it took barely twenty minutes or so, and then we turned into a wooded patch with well spaced-out apartment blocks. It had just rained, and the place looked fresh and magical. The authorities had prominently displayed signages that this was dengue prone area. I was a bit surprised that the scourge afflicts Singapore as well. 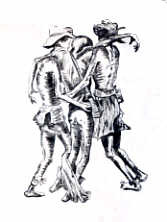 The painting, by Australian, Ray Parkin, shows two men with malaria supporting a man with cholera between them. A Japanese guard had refused to let the man with cholera be taken back. Eventually, he gave permission for him to be taken back by other sick men, two men with malaria. While photography inside the museum wasn't permitted, I made a few mental notes of what I saw in the museum. It was here that I got to know that the name Changi came from a local tree that grew here, whose wood was prozed for its strength and durability. The museum dedicates itself to the POWs incarcerated in Changi as well as troops from various countries that came to Singapore's rescue - Indians, Australians, Malayans, Dutch and British. Singapore fell to the Japanese after an intense invasion of the island by the Japanese from Malaya in February 1942. For long, the British thought that Singapore was well defended and that the Japanese would take a hell lot of time to get their way through the thick Malayan rainforests. Delusional as they were, they nicknamed Singapore as the "Gibralter of the East". Immediately after the British surrender, Singapore was Nipponified - the island was renamed Syonan-to (昭南島 - Light of the South), clocks were shifted one-and-a-half hours, aligned with Japanese time, a new currency was introduced to replace the Malayan Dollar. The Japanese unleashed a wave of terror on the island targeting ethnic Chinese - they were forced to line up on streets and those suspected of being anti-Japanese were purged - these were known as Sook Ching incidents. Massacres were frequent, the most infamous ones were the Double Tenth incident and the Alexandra Hospital massacre. But, for those incarcerated in Changi, life was equally trying. Intially the Japanese didn't know what to do with so many POWs, so some were transferred to construct the Burma-Thai Railway. The ones who remained here were put on to odd labour jobs. Food was basic - noodles that had rubbery consistency, that were served in discarded metal cans, with a topping of red palm oil. To supplement their diet, the prisoners ate snails and grew vegetables on the prison. The men interned here also gainfully engaged themselves - for instance Stanley Warren, a British bombardier, painted five murals, which had Biblical themes. Today, these are preserved by the Singapore defence forces. They also called the prison ‘University of Changi’, as prisoners shared their expertise, skills and inventiveness with each other. But, there were good Japanese as well, Mamoru Shinozaki was one such good soul, who is also called the Japanese Schindler. He was a Japanese diplomat based in Singapore and is credited with saving lives of Chinese by his liberal issue of personal safety passes and the creation of safe havens. He later testified during the Singapore War Crimes Trial between 1946 and 1948. He later wrote a book called Syonan—My Story, which chronicled the Japanese occupation. The prisoners constructed a chapel for themselves. 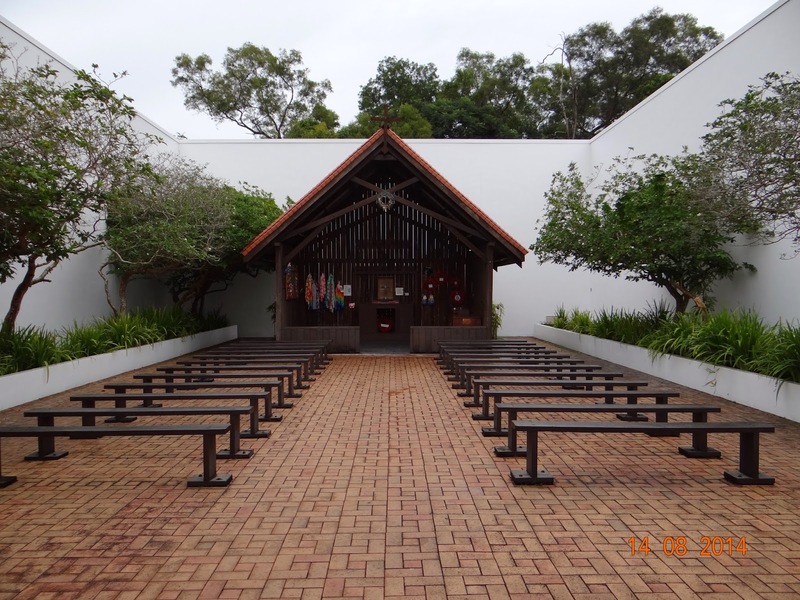 A replica of the chapel has been recreated at the Changi Museum.